Normally, other cats should be avoided. However, you will eventually desire romance in your life. After finding a suitable mate, romance is best accomplished outside, in the dark, under the humans bedroom window. My romance is my dear Princess Mia Bella. We have yet to sing a duet underneath the bedroom windows. Purrs to you my sweetie, this is one of my favorite pictures of you. It makes my heart and tail go, thumpity, thump, thump. We are back to having open window season again. The hot weather went away and mum could come home and open all the windows. It feels pretty good, but probably a bit cool for some. Mum feets were cold so she put her wooly slippers on. Plus the clouds wented away overnight so we could see a very pretty moon outside tonight. Looking pretty much like a full moon. Flower Friday, we give you a day lilly. One of the first to open up this year. Mum has several different colors of these, but this is the first one to open up this summer. The summer flowers that do well in the hot weather are starting to open up. Plus the noisy holiday must be coming up soon. Last evening we heard some loud pops not too far away. Mum says they were firing crackers, oh, firecrackers. Then on the moving picture box they had boomers with bright colors last night. Something about starting a bang for bummer fest. Sounds strange to me. Oh, well. It is almost the weekend. Hope veryone has a good weekend. 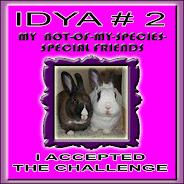 Have fun at The Rainbow Bridge with all of our other blogging buddies who have gone before. Chatham just left us last week, you two newbies can keep each other company. You will be missed, lots of love to your family and Meep. You will always be in their hearts. 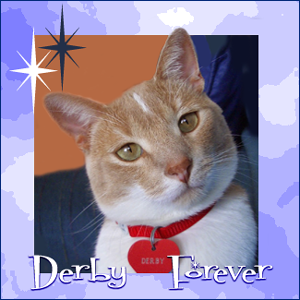 Special purrs go out to my blogging furiend Buzzerbee. On Thursday he will be helped to The Bridge. Please stop by and send him on his way with a kind word. God Speed Buzzerbee. We will miss you. Well mum stopped on her way home from shopping on Sunday to take pictures of the waterfall in our little town. She drives past all the time on her way to and from Grampies. So she took her camera with her and stop special just to take some pictures. When she started to look she saw all sorts of duckies around the falls. These two cooling their feet in the water on the top of the falls. These guys were at the bottom of the falls on the side away from mum. These were just underneath where she was standing. She didn't take a picture of them but some kids were just out of camera range with their fishing poles. Last night when mum came home she saw this in the drive, she wonders if she ran over the little birdie with the metal monster! Mum didn't mean hurt the birdie if she did, or if it was already there and injured and it couldn't move. Poor birdie. Mum is furry sorry if she killed you by accident. Lastly, mum is still not happy with the squirrels. They got at Phat Flower Eric and started digging in him too. Sheesh, the squirrels have no respect. Virginger was right there but wasn't able scare it or stop the squirrel. Samantha and Tigger were impressed that I have gotten to 26,000 visitors and wondered how long I have been blogging. I started in November 2005. So over a year and a half. At that time there were maybe 2-3 dozen blogging kitties, now we have nearly 200! So the visits add up fast. 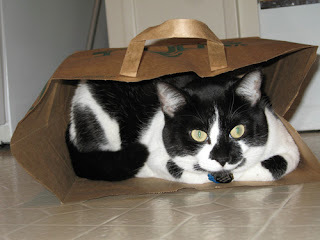 But kitties like Max who have been blogging furrever have over 200,000 visitors! I have a long way to go to catch up with him. Mum also got my Secret Paw package taken to the station Monday evening. So my special furiend, your stuff is on it's way. Could it be you? Hmmm, wait a second. This blog is supposed to be about me! Sure it is one thing to show you other stuff, but there hasn't been a picture of me since Friday's post. Not acceptable, so to satisfy all of my fans, me! And the modern interpretation is that our beans are our guardians not owners as you can't really own us. I think I agree with that. Mum is a good guardian for me. I get taken care of properly, food, water, a box that gets cleaned daily. I get played with and loved. Mum went outside today and started saying things that I can't repeat here. It as "%$#*&^% Squirrels". They got into some of the plants and dug them up. She was not happy on this at all. A pet-unia that got pulled out of the pot, but mum was able to put it back inside the planter. Then they dug/chewed off some of the Christmas catci too. This plant flowers better when it gets to sit outside during the summer and into early fall. But if they chew off the leaves then it won't be able to bloom on those branches at all. Mum gotted all rested yesterday. She did the shopping and washing, then went outside and caught up on some magazine reading. She filled the birdie feeders and filled up the birdie baths too. But just relaxed and didn't have to worry about being anywhere at any specific time, so she could just sit outside and enjoy the beautiful day. While mum sat outside she has a few small visitors who stopped by to pick at some of the spilled biride seed and they weren't birdies. This is is Chip, a little monk who stops by in the summer. It is interesting in that the noise it makes is more like a birdie chirping. Then after Chip left this baby bunny dropped by. Mum got one good picture and then the bun hopped off to hide in mum's flowers. Must be a shy bunnie. Plus mum saw a young robin following it parent around, also what looked to be a younger/smaller Cardinal. Mum also checked the bird house and the baby wrens have moved out. Plus as promised she got my Secret Paw package ready. I did the final inspection and approval of the items put into the package. Plus the package I owe to Scooby, Shaggy & Scout for being my 26,000 visitor. So now she just has to go to the station with them to get them off. Well sort of a rest day for mum. She does have the washy stuff to do, but she already finished the shopping part. And she promised to help me with my Secret Paw package later too. So why does mum need rest today? Well she went off with her furiends yesterday and hung out at this place yeterday. Some guys had a problem and are off the track, mum says they were off in the "kittie litter" as the big areas are just full of small stones. Mum says they need big equipment to get the debris/cars out sometimes. She is glad it is not her job to keep these areas clean. So what does mum do? Well she calls it playing in traffic, but they line up the cars for sessions, making sure for races they are in the proper order. Here they have the last group of the day lined up for the race. Then they come around behind the pace car and off they go. Let the racing begin. But while mum and her furiends have fun while they work the event, they are always happy to see the final time that this flag gets waved. Then they can relax and chat with each other. You can see the beginning of mum's one adult beverage, she will put some soda in this to dilute the stuff. Most everyone drinks beer, but mum doesn't care for beer. Here you can see them chatting, even a new woofie, Tanner. Mum says Tanner is nice but was a rescue and is a little bit skittish around people yet. So he doesn't like getting petted, but will take a treat from ANYONE. Then the race people fed them dinner and mum came home. She said they made a big change to the track this past winter. They now have a tunnel to go under the track to get out, instead of a bridge to go over the track. They took the bridge down so that the bridge supports were not close to the track. Seems a few people have gotten hurt at the bridge in the past, so it is gone and the area is wide open if a car goes off the track now. So down under the tunnels she goes. The sun getting ready to set as mum drove home. She got home and she quick helped me with the meme. Then being tired took a shower and went to bed. 5. Ever been in an airplane box? Ummm, no. 8. Where would you like to travel to? I will stay home thank you. 11. Do you have any dark secrets? If I do, I won't admit them here! 15. Are you into extremes? 19. What makes you happy? Having a nice furrever home to live in. 20. Your most embarrassing moment? Sorry, not going to admit to this one. A mancat has to keep his dignity. The cat strives for grace and elegance of movement at all times. Failing this, act as though any inelegant gesture was intential. hehehehe, I don't think mum has a picture of me being inelegant. First I take a good picture, second I try not to get caught if a do make a bad move. Mum is certainly looking forward to the weekend. She worked furry long on yesterday, said something about an issue with China. So she didn't do much tonight but just watch a little TV and look at the mail. I tried to make her feel better. Lots of snuggles. So one more work day for her until the weekend. Yippee for all of us. Ooopsss. I forgot to remind mum to post a Flower Friday. So I made her turn on the puter first thing and pick us a flower. Mum thinks the purple flower is a Campanula. That is all, Happy Friday! Perhaps you noticed in the picture the other day a video that is titled 'The Royal Mews'. You can see it just above my one hind paw. You can biggify if you want. I figured her Majesty has kitties and since she has such a big house, lots of kitties. But mum says Her Majesty mainly has woofies and that the word 'mews' does not apply to the sounds that we kitties make. Mum says it refers to the place where they keep the horsies for Her Majesty to ride or pull her carriage. Or even keep the fancy cars she rides in. The weather got nice again, so mum can open the windows for me again. It was so nice sitting in the window and watching the birdies and outside buns. Keeping watch, I can't see any birdies in the pictures but I can hear them. Mum checked the wren nest tonight, but the babies were snuggled down where she could just see them. Still not sure if two or three in the nest. There must be something out there, my tail won't hold still! I didn't see it but mum says she saw a baby bunnie tonight. She said she knew it was a baby as it was so small. It ran under a bush and hid from her. Mum would you just go away with that picture box thing, flash or no, I just want to look out the window in peace. Go take a shower! As anyone who has ever been around a cat for any length of time well knows, cats have enormous patiences with the limitations of the human mind. Cleveland Amory. Now this is very true. We ask for a treat and they toss us a toy. We want to play they give us a treat. We want to sleep, they put the flashy box in our faces. Someday our beans will learn cat. Here I am clearly telling mum I need a treat, but do I get one? No, I get the flashy box in my face. I'm trying to take a nap and I get a toy tossed at me. Oh well, mum does try, but she says she is not good at languages other than her own. At least she admits that! Hope every one had a nice weekend. Mum went and got Grampie and they had a nice light lunch and then sat on the patio. It had been hot but cooled off enough for them to sit outside in comfort. We all just watched the birdies, them outside, me inside. One robin took a really long bath in the birdie bath. Mum looked at the water after and it was terribly dirty. Mum also took a quick peek inside the birdie house that has the baby wrens in it. She said she saw two heads for sure, wasn't sure if their might be a third baby birdie. She didn't want to be by the house for long, so as not to upset the birdies. I mentioned on my last post about the house that they put in walkway's for the kitties. Well here is a linky so you can go see The Cat House. Thanks to Fritzamus Maximus for giving me the link, mum says this is the place. The link only shows one room, but you get the idea. Like I said yesterday mum was disapponted with the new pet store near us. Said stuff was costed more than other stores and we all need to save our green papers. Well a few weeks ago she went to a short meeting at the HAWS shelter that talked about what you can do to keep your kittie happy by playing with them. Mum said she pretty much knew all of what they said, give us stuff to play with, stuff to practice our hunting skills of stalking and pouncing (for those of you who don't have real mousies to work with), and playing with us several times a day for 10-15 minutes at a time. Specially just before bed time to get us tired, so we leave you alone and you can sleep. The only thing that mum didn't agree with was leaving the radio or TV on. She says I would be sleeping most of this time anyway, so why have it on! The most fantastic thing they showed was a short video of a family that made their house into a kittie playground. Ladders for their kitties to climb up to the top of the room, then along the top of the room walkways that went across the rooms and even from room to room, going through the walls! Mum is not likely to do that for me. Says it would cost more green papers than she could afford. So what were some of the thngs and simple things to play with? See below, all homemade! On the left is a baby stocking filled with stuffing and catnip and then just sewed shut at the top. Then a spider thingy made with pipe cleaners with a little fluffy thing glued on (optional) and the pipes are bent over at the end to keep the scratchy part away from us. Then a milk jug ring that had been crow-shayed around to make it bigger. I checked them out and they are pretty good. The stocking could use more nip, but if you make your own, the you can put as much nip in it as you want! Everyone attending got one of the little toys above, but then they drew out names to give out other toys and mum said we already had those type of toys, but what we didn't have was a big fancy fevver. She got lucky and got a fevver, she says it is a peacock fevver and I think it is pretty. So here she is showing it to me and getting me to pounce on it, then slowly tickling me with the fevver and then me turning to try to get it. Mum finds it hard to take pictures while she is playing with me, so not many pictures. But this is such a fun fevver to play with. Mum has seen these sold in one of the local pet store here near the toys. So they know a good thing! But then play time is over and mum has to put the fevver away, so it sits up on top of the mirror thingy. I know it is there but I can't quite get to it from the table. Mum isn't it time to bring that down so we can play? Soon please? I hope the rest of you get lots of play time today with your beans. Have fun, I will. Let's go mum! Happy Father's Day to all the dad beans and grampies out there too. A big purr to my Grampie, love you. When peace and tranquility are achieved, purring may commence. Well you can't take a picture of purring, but we kitties purr lots. Some even when we are sick. My picture is me watching out the big windows at the birdie feeders. We have baby birdies too. We can't see them but we sure can hear them. The mum and dad birdies come by and feed them and that is when we hear them call for food. This picture is a little blurry 'cuz mum had to take it from far away with the zoomer lens. But you can see one of the parent birdies getting ready to feed the little ones inside. Mum says the birdies are wrens and they are tiny birds, but they have a great big song to sing. Mum says we have had wrens nest somewhere in the yard every summer. Mum was outside last evening talking with the neighbors and their little sticky thing came up by the house. I was glad that he was outside and I was inside. He laughed a little and then his Dad came and got him and took him away. And for Flower Friday we have columbines. We have lots of them and in a few colors. Someone mum knows at work is riding his bicycle all the way across the United States to raise money for cancer. You can check out Matt Across America here. Mum went shopping last night for our Secret Paw stuff and something to send to Scooby, Shaggy & Scout. She went to check out the new pet store that opened near us. She did get a couple of things, but she said the stuff costed more there than other places. Plus she isn't happy that they had a sign on the door that said they would buy kittens. That means some people might see it and make more little kitties so they can make money. There are so many kitties in shelters that need homes, we don't need to have more litters. The great debate is coming. The feline presidential candidates will match up and answer your questions. The moderator is Skeezix and he is asking for your questions. So if you have questions for the candidates, stop by and leave your question. Looks like it is going to be a nice weekend so hope everyone has a good time with lots of treats and snuggles. Mum saw that Scooby, Shaggy and Scout were the next commenters after the 26,000 level was hit. But she went to bed last night before she posted everything. So we agree with Tara (not the cat) that SS&S will be the honorees! Ohh, mum is working at home and needs her 'puter back. Gotta run, the birdies are calling! OK gang lets try this again. As I post this my counter is at 25,948 and it is about 6:30 Central Time. So who will be my 26,000 visitor? So I expect to see a count up to the lucky visitor! My counter is on the right hand sidebar and looks like billiard balls. So I am patiently waiting to see who will drop by tonight. This is how mum decided we would do this, just redo the count. Very quiet here the past few days. No more mousies, so I can just watch the birdies. One last mousie showed up. He was hiding in the big windows that go to the floor and I kept pawing at the door which was almost totally open. It was night time and mum turned on the lights to see if she could see anything. She didn't, but since it was time for her to sleep, she shut the door. So as she got ready Sunday morning to get Grampie for church, she looked over to see me pawing at the closed door. To her surprise she saw the mousie running up and down the screen! Below are pictures of the mousie as it moved around the screen. Even though mum was ready to leave she wasn't going to let this mousie just sit there for the time she was gone. She was determined to make sure he didn't escape. So she slowly and carefully opened the door and smacked the mousie with a shoe. It dropped down to the bottom of the door and I kept watch on the mousie while mum went to get a paper towel to pick up the mousie. But then as she tried to pick up the mousie, it ran away! But not far and I was right on it! I pounced on it and then mum smacked it again with the shoe. It was just twitching and then mum smacked it again! So once she picked it up she put it inside a bag and took it outside to the trash. Mum showed it to Grampie when they got here. It was still dead and Grampie said it looked like a baby mousie. Mum just keeps looking to find where these guys are getting in the house. Must be some small hole that she can't find. She has even paid the Governator to come in but all they do is put out poison or traps. Mum says that she can buy lots of mousie traps for what she pays them and the problem still isn't solved. No I don't get to eat the mousies. Like Max said, they could have cooties and mum doesn't want me to eat anything that might have cooties on it. Plus just in case the mousies might have been at the poison, mum doesn't want me to get that either! So since Sunday morning we haven't had any more mousies, so mum is hoping that we got this little family eliminated. Plus we found a story about a kittie with lots of toes, maybe even more than Mittens, who lives in the UK. He has 26 which they are trying to figure out if this is a record. That is us kitties, beauty, strength and grace. Whoever anonymous is was correct. Grampie came over Sunday afternoon and he and mum didn't do much. Sat on the patio and chatted. So I just chilled in the chair that is just inside of the patio. Guess I had to rest up after keeping our house mouse population down. But it was a party weekend too. I popped over to Parker's since she was alone. Lots of other kitties dropped by and well, we had a good time. Also spent a little bit of time at LilyLu's and Iris's purrthday party and some time at the Luau at Oreo's house. What a busy weekend! No wonder I keep falling asleep or napping. I finally get to rest!